If the brake cable is rattling secure it with zip ties. The crew from the Global Mountain Bike Network know what’s up. In this video, they reveal tips that are useful — and easy enough to perform on the trail. 1. Shifter position is often overlooked part of setting up your bike. Have a think about where your thumbs will naturally rest when you are in your riding position. 2. Tall riders often find they cannot get their bars wide enough. To slightly extend your bar width, move your lock on grips slightly outboard so they extend beyond the end of your bars. 3. To tidy your cockpit, use a spiral cable binder to tie two loose cables together. Alternatively, you can use a cable tie and a washer. 4. Especially useful in wet and muddy conditions, try adding some grip tape to your controls to stop your fingers slipping off. 5. Don’t be afraid to cut or file down certain parts of your tire’s tread to get exactly the ride characteristics you want from them. 6. To stop your front brake hose rattling, use a cable tie and a washer to tie it to your fork. If you are running a front mudguard, this can also be a way to neatly mount it to your fork. 7. Front mudguards are easy to make yourself, alternatively there lots of great aftermarket options, including a GMBN branded one. 8. When setting the rebound on your rear shock, think about what sort of riding you do most. If you regularly hit big jumps, you might want to slow down the rebound to stop yourself getting bucked off on hard landings. 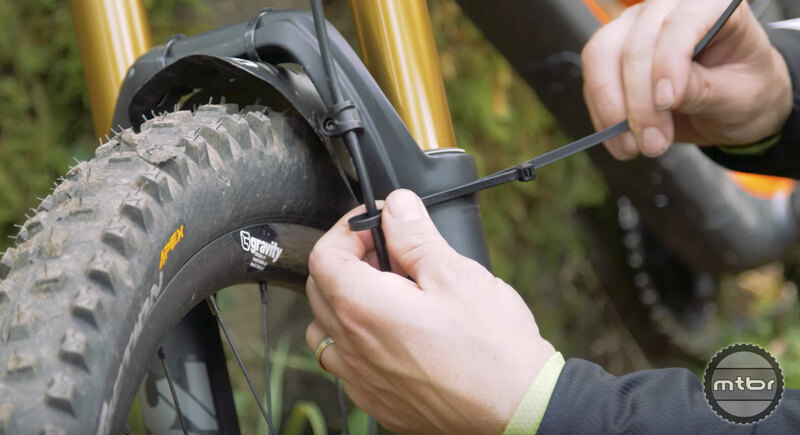 Alternatively, if you do a lot of downhill riding, you might want a faster rebound to ensure you keep traction on rough or rooty sections of trail. Check out more useful How To content on Mtbr. Use that computer cable organizer for your bike cables. I find it hard to believe that a fender that size does anything but keep the other side of the fender clean. Keeps crud from being flung up into the air at the height that you would ride into and catch with your face.